My chosen subject for this article is the puerile and inane jabbering that infects the BBC institution Match of The Day. Don’t get me wrong I love MOTD but I can’t stand anything of the generic matey banter that oozes out, loosely classed as ‘punditry’. The commentary is about as interesting as that on my Lesbian Vampire Killers DVD. How I regret buying that DVD. I’ve written on this before in another blog which can be found here (http://www.thedailytouch.com/entertainment/tv-film-theatre/match-of-the-days-irrelevant-analysis/) Simply put I’m disappointed in Hansen, Lawrenson and Shearer’s woeful attempts at insight and I wish all pundits could be like Gary Neville, as the eminent Michael Cox backs me up on. Interestingly this weekend, Match of the Day broke from the turgid pattern I previously discussed. With only the Liverpool V Swansea game to show MOTD presented a show of extended highlights of one game with analysis and comment throughout. With Michael Owen, not exactly the most tactically astute and insightful player I know, provided an interesting look at the game. A welcome break from the usual discussions of ‘John Terry headed that well’ and ‘YaYa Toure got forward more here than he did here’ we were actually treated to evaluation of the effects of top spin on a striker’s technique and the different approaches of a left and right footed player in a certain situation. This kind of commentary made it worth actually paying attention for once. To reward this as innovative new commentary is misleading however, it is actually so old school that most of us have forgotten about it. This is how Match of the Day used to be every week back in the 60’s and 70’s when they picked one game to focus on; providing extended highlights and a brief roundup of other results. There only being one game on this weekend forced (or allowed) the producers to return to a tried and tested format. This isn’t to say that this weekend’s MOTD was a watermark. Whilst it was refreshing, and Michael Owen was trying his hardest, he’s just too nice to criticise anyone. When asked about Laudrup’s decision making in a 5-0 drubbing he couldn’t bring himself to speak ill of the manager. Like Jamie Redknapp he is too nice to be of any interest to viewers demanding a keen insightful eye. Owen lacks the ruthlessness of a Gary Neville to be able to criticise in frank terms. It wouldn’t be unfeasible for the BBC to adopt the attitude of foreign ESPN commentary or Gary Neville’s sky commentary (see Michael Cox’s article http://www.guardian.co.uk/football/blog/2012/nov/27/gary-neville-punditry-sky-bbc) and employ research and dedicated insight to a high degree of technical and tactical astuteness. However that would be too difficult. People watch every week and either tune out, fast forward or scoff in derision at almost every word. Yet the BBC is in a comfortable position of being able to allow the familiar faces to churn out just enough to be understandable to anyone with a knowledge of which direction the players are trying to kick the ball in. This brings me to my next complaint and the title of this article; the ostracism of Colin Murray. 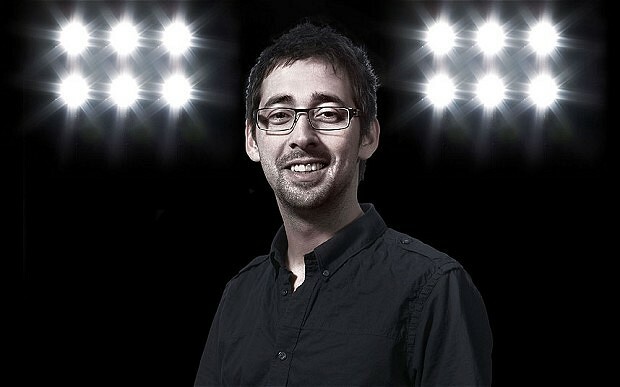 I don’t like Colin Murray’s level of insight or his commentary. I’m quite happy his contract won’t be renewed because he isn’t particularly interesting and many, me amongst them, find him downright annoying. However I’m vociferously against the reasons for his contract not being renewed, which basically amount to him challenging the status quo from an untenable position as someone who is not an ex- footballer. This in itself is an example of an extension of the kind of player power John Terry would be proud of. Are the BBC pundit’s opinions so sacrosanct that anyone questioning them must be burnt at the stake? 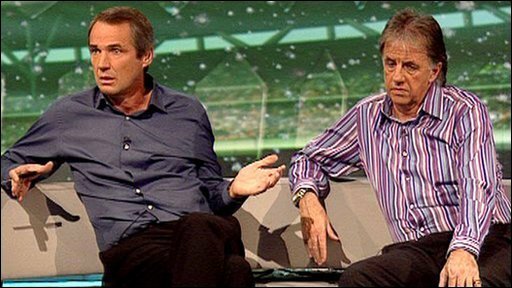 Why is disagreeing with Alan Hansen a sackable offence? Even if you don’t agree with Murray at least he is trying to spark debate rather than listening to the moribund Hansen and Lawrenson continuing in their plunge into the depths of bitterness and vapidity. He’s still more interesting than Alan Shearer. Admirably in the Match of the Day I discussed earlier Murray persevered with his presenting style even though he knows it is what got him sacked. Sticking to his guns in the face of defeat shows a consummate professionalism that the “ex-pro’s” he is surrounded by could learn something from. With his leaving however I welcome Mark Chapman, Dan Walker or whoever the producers choose to substitute into the position in the long term. Perhaps he will become the BBC’s answer to Gary Neville that I so crave. To all those interested in hearing the beginnings of Michael Owen’s rise to punditry please enjoy his work providing the commentary for these helicopter tours in Dubai… yes you read that right. This entry was posted in Analysis and opinion and tagged alan hansen, alan shearer, bbc, colin murray, dan walker, espn, gary lineker, gary neville, jamie redknapp, mark chapman, mark lawrenson, match of the day, match of the day 2, michael owen, motd by David Wild. Bookmark the permalink.